The RP Photonics Buyer's Guide contains 35 suppliers for fiber-optic sensors. Fiber-optic sensors (also called optical fiber sensors) are fiber-based devices for sensing some quantity, typically temperature or mechanical strain, but sometimes also displacements, vibrations, pressure, acceleration, rotations (measured with optical gyroscopes based on the Sagnac effect), or concentrations of chemical species. The general principle of such devices is that light from a laser (often a single-frequency fiber laser) or from a superluminescent source is sent through an optical fiber, experiences subtle changes of its parameters either in the fiber or in one or several fiber Bragg gratings, and then reaches a detector arrangement which measures these changes. They consist of electrically insulating materials (no electric cables are required), which makes possible their use e.g. in high-voltage environments. They can be safely used in explosive environments, because there is no risk of electrical sparks, even in the case of defects. They are immune to electromagnetic interference (EMI), even to nearby lightning strikes, and do not themselves electrically disturb other devices. Their materials can be chemically passive, i.e., do not contaminate their surroundings and are not subject to corrosion. They have a very wide operating temperature range (much wider than is possible for many electronic devices). They have multiplexing capabilities: multiple sensors in a single fiber line can be interrogated with a single optical source (see below). 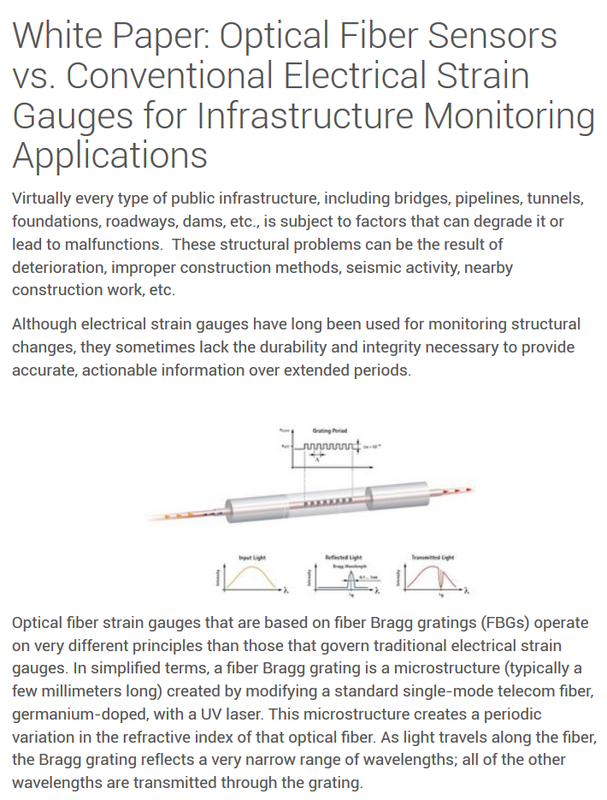 Fiber-optic sensors are often based on fiber Bragg gratings. The basic principle of many fiber-optic sensors is that the Bragg wavelength (i.e., the wavelength of maximum reflectance) of a fiber Bragg grating depends not only on the Bragg grating period but also on temperature and mechanical strain. For silica fibers, the fractional response of the Bragg wavelength to strain is roughly 20% smaller than the strain itself, since the direct effect of strain is to some extent reduced by a decrease in refractive index. The temperature effect is close to that expected from thermal expansion alone. The effects of strain and temperature can be distinguished with various techniques (e.g. by using reference gratings which are not subject to the strain, or by combining different types of fiber gratings), so that both quantities are obtained at the same time. For pure strain sensing, the resolution can be the range of a few με (i.e., relative length changes of a few times 10−6), and the accuracy may not be much lower. For dynamic measurements (e.g. of acoustic phenomena), sensitivities better than 1 nε in a 1-Hz bandwidth are achievable. Other fiber-optic sensors do not use fiber Bragg gratings as sensors, but rather the fiber itself. The principle of sensing can then be based on Rayleigh scattering, Raman scattering or Brillouin scattering. For example, optical time domain reflectometry is a method where weak reflections can be localized using a pulsed probe signal. It is also possible, e.g., to exploit the temperature or strain dependence of the Brillouin frequency shift. 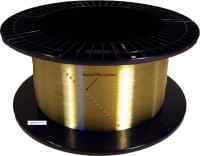 In some cases, the measured quantity is a kind of average over the full fiber length. This is the case for certain temperature sensors but also for Sagnac interferometers used as gyroscopes. In other cases, position-dependent quantities (e.g. temperatures or strains) are measured. This is called distributed sensing. In one technique, called wavelength division multiplexing (WDM) or optical frequency domain reflectometry (OFDR), the gratings have slightly different Bragg wavelengths. A wavelength-tunable laser in the interrogator unit can be tuned to the wavelength belonging to a particular grating, and the wavelength of maximum reflectance indicates the influences of strain or temperature, for example. Alternatively, a broadband light source (e.g. a superluminescent source) may be used together with a wavelength-swept photodetector (e.g. based on a fiber Fabry–Pérot) or a CCD-based spectrometer. In any case, the maximum number of gratings is typically between 10 and 50, limited by the tuning range or bandwidth of the light source and the required wavelength interval per fiber grating. Another technique, called time division multiplexing (TDM), uses identical weakly reflecting gratings, interrogated with short light pulses. The reflections from different gratings are then distinguished via their arrival times. Time division multiplexing is often combined with wavelength division multiplexing in order to multiply the number of different channels to hundreds or even thousands. An optical switch allows one to select between different fiber lines, further multiplying the possible number of sensors. 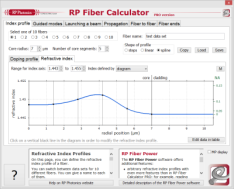 Fiber Bragg gratings may be used in interferometric fiber sensors, where they merely serve as reflectors, and the measured phase shift results from fiber spans between them. There are Bragg grating laser sensors, where a sensor grating forms the end mirror of a fiber laser resonator, containing e.g. some erbium-doped fiber, which receives some 980-nm pump light via the fiber line. The Bragg wavelength, which depends on e.g. temperature or strain, determines the lasing wavelength. This approach, which has many further variations, promises very high resolution due to the small linewidth of such a fiber laser, and very high sensitivity. 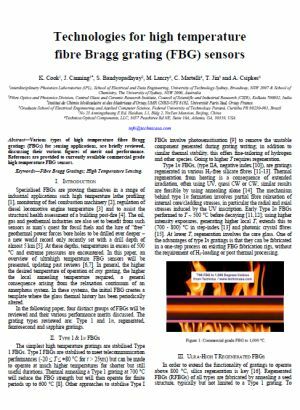 In some cases, pairs of Bragg gratings are used as fiber Fabry–Pérot interferometers, which can react particularly sensitively to external influences. The Fabry–Pérot interferometer can also be made with other means, e.g. with a variable air gap in the fiber. Long-period fiber gratings are particularly interesting for multi-parameter sensing (e.g. of temperature and strain), and alternatively for strain sensing with very low sensitivity to temperature changes. Even after a number of years of development, fiber-optic sensors have still not enjoyed great commercial success, since it is difficult to replace already well-established technologies, even if they exhibit certain limitations. For some application areas, however, fiber-optic sensors are increasingly recognized as a technology with very interesting possibilities. This holds particularly for harsh environments, such as sensing in high-voltage and high-power machinery, or in microwave ovens. Bragg grating sensors can also be used to monitor the conditions e.g. within the wings of airplanes, in wind turbines, bridges, large dams, oil wells and pipelines. Buildings with integrated fiber-optic sensors are sometimes called “smart structures”; they allow one to monitor the inside conditions and to gain important information on the strain to which different parts of the structure are subject, on aging phenomena, vibrations, etc. Smart structures are a main driver for the further development of fiber-optic sensors. 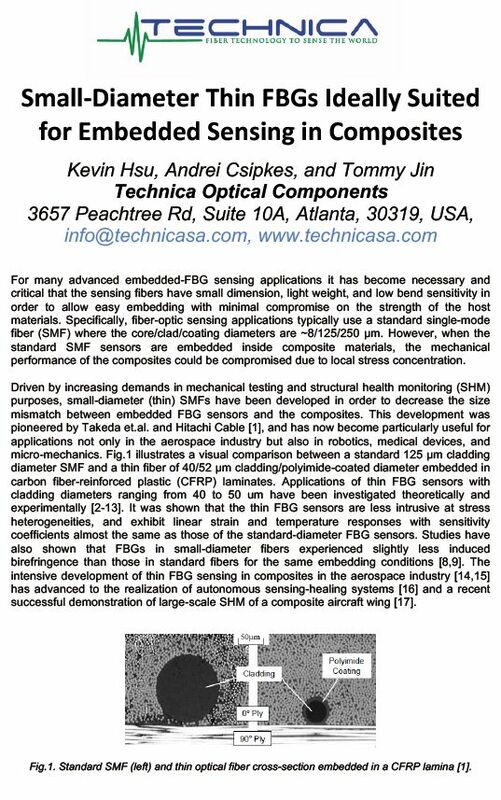 Premium quality fiber Bragg grating sensors and FBG array sensors in acrylate, polyimide, and gold coated fibers, specialized polyimide-coated sensors to 300 °C, high-T FBG sensors to 1,000 °C, radiation hard/proof sensors, bio-chem tilted FBG sensors and ultra-thin FBG sensors and arrays. We produce GFRP FBG cable sensors for embedding into concrete and other materials, Zeus PEEK FBG cable sensors for monitoring in transformers and chemically active environments, and vibration-sensitive cable sensors for security. With the LIOS Sensing product line, NKT Photonics is the market leader in distributed optical sensing of temperature and strain for security, safety and fire detection. Backed by more than 20 years of experience and thousands of systems in the field worldwide, we deliver LIOS monitoring solutions with unrivaled quality and performance. Our LIOS distributed temperature and strain sensing solutions give you a quick and easy overview of the status of your installation. We use passive optical fibers as distributed sensors, they are immune to vibration, electromagnetic noise, dust, cryogenic temperatures, and moisture. You get continuous and accurate monitoring of temperature and strain over long distances or across large surfaces – at the speed of light! It is highly reliable too, offering you a Mean Time Between Failure of above 45 years. The newly developed optical sensor line newLight enables large strain measurement ranges at increased long-term stability. It is the ideal choice for structural health monitoring due to its fast and easy installation and its resistance to environmental conditions such as humidity, rust, and salt even over extremely long distances. The compatibility with standard telecom cables makes this line very cost efficient – especially for medium-to-high channel applications. The newLight range is based on the Fiber Bragg Grating technology and offers optical sensors for measurements of strain, temperature, accelerometer, and tilt. 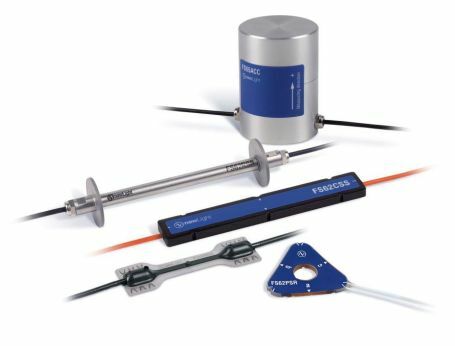 In addition to fiber optical sensors that measure strain, temperature, acceleration, tilt or displacement, HBM also offers optical interrogators, software, as well as service and support for every application.